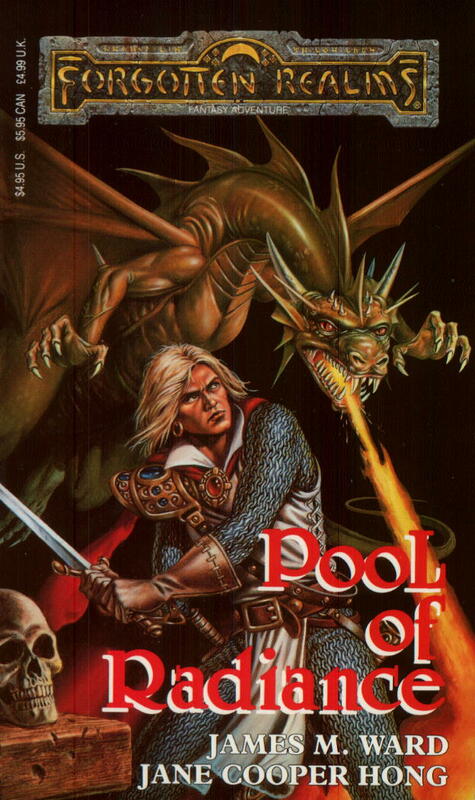 Pool of Radiance – Let's Read TSR! One of our authors here was veteran game designer Jim Ward, one of Gary Gygax’s early playtesters for D&D and a long-time writer and designer at TSR. (The spell Drawmij’s instant summons, present in every edition of the tabletop game, was named after him.) As one of the authors of the Ruins of Adventure module, he must have seemed like a logical choice to write the novelization, despite the fact that this was his first foray into fictional writing. Jane Cooper Hong was another TSR employee, a fiction editor turned writer; this was her first and only published novel. So did these two relative newbies turn out something worth reading? Well… no and yes. It’s about as bad as the description “video game tie-in novel” would suggest, but amidst the many distracting flaws one can find the occasional inspired bit. An apprentice mage who’s accidentally transformed herself into a buff amazon, a retired thief mourning his dead lover, and a fervent young priest of Tyr walk into a bar… stop me if you’ve heard this one before. But seriously: like many a classic D&D story, this one begins in a tavern. The characters don’t quite heed the call to adventure; it’s more like they’re arrested and thrown in the general direction of the call, a favourite tactic of Dungeon Masters with difficult-to-motivate players. They spend the book fighting the evil overlord of the city’s monsters and his quisling human ally, resolving their various subplots in the process. Everything in this novel runs on improbable coincidence. A guy with two incredibly rare magic rocks happens to cross half of Faerûn and end up in a city where an evil overlord needs exactly two incredibly rare magic rocks to complete his evil plan. Shal happens to look just like Ren’s dead ex. The frogs at the beginning happen to belong to the crazy archmage from later on. The villain happens to be the murderer of Shal’s master — not just the guy who ordered it, but the guy actually holding the knife. And worse yet, the heroes don’t have any agency to resolve their contrived situation. Every major problem in the novel is resolved by some flavour of deus ex machina — a magic staff that blows everything up, inexplicable divine intervention, a magic wish, et cetera. In the end, the heroes don’t actually do all that much. They’re forced into dealing with a problem at the outset, there’s a little bit of actual work in the middle, and then it’s suddenly resolved by magic at the end. Rinse and repeat. 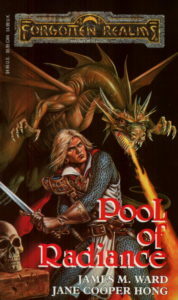 The setting had a lot of promise, but I think it was actually explored better in the D&D module and the video game than it is in this book. Here’s the pitch: The city of Phlan was destroyed fifty years ago by raging dragons; today, civilization has made a small foothold near the old docks and people are trying to reclaim the ruined city from the monsters which infest it. Adventurers explore ruined libraries, temples, slums, and plazas on their way to the heart of darkness, a run-down castle at the centre of a deadly hedge maze. In other media, it had the properly grim, dilapidated feel of a ruined city, with an ecology that had a little bit of internal logic to it. This novel is focused more on developing the characters and their stories than on developing the setting, so everything outside of the city walls of New Phlan feels like a set of disconnected adventures. This novel has no subtlety at all about its villains. Porphyrys Cadorna is introduced within a page of his first appearance as an ambitious and unscrupulous government official who’s scheming to rule the city of Phlan and treats his underlings like dirt. Then, for good measure, he’s outed to the reader as the murderer of Shal’s master. Clearly suspense and a slow buildup weren’t what the authors had in mind. Anyone evil is going to have “BAD GUY” stamped on their foreheads in big letters right away, just to make sure the reader knows who to root for. What makes this even more baffling is that Cadorna is putting on a wise, thoughtful, concerned façade to fool everyone into thinking that he’s a good guy, but the instant the heroes meet him, they all instinctually recognize that he’s evil. So… is everyone else in the entire city just too much of an idiot to realize this? Are the heroes the only people with any sense? Because he’s really bad at hiding what a scumbag he is, but somehow nobody else ever opposes anything he does. He starts out as a junior member of a ruling council of ten people, but the others just keep promoting him like nothing’s wrong. Tyranthraxus, the greater-scope villain of the novel, gets only minimal screen time. What little there is is basically your standard “evil overlord wants to amass power and rule the world” stuff, so there’s just not much to say about him. Let’s move on. The heroes, fortunately, are a bit more nuanced. In fact, they’re easily the best part of the novel. They’re all basically good people who are damaged in various ways, and that damage clearly informs their reactions to situations and the shape of their character arcs over the course of the novel. They get many good establishing character moments — the entire first quarter of the book is devoted to setting up the heroes individually before they meet and begin to work together. Many of their character moments are memorable and well-done: Tarl’s harrowing initiation rite for the priesthood of Tyr, Ren saying goodbye to the memory of his dead girlfriend, or Ren and Shal’s surprisingly mature and respectful “let’s just be friends” discussion. The book really shines when it’s not trying to do evil plots or battle scenes, and just lets the characters interact in a natural fashion instead. It’s particularly nice to see a cleric whose faith actually feels like a meaningful part of their character. All too often, D&D fiction will just treat faith as a convenient explanation for why someone has magic powers without getting into the personal side of it at all — which is a crying shame, since it’s easy material for some good characterization. Curiously, though, there’s not really much in the way of a supporting cast around the protagonists. They tend to be either flat stereotypes, like the gruff innkeeper; only present for a brief scene, like the lady adventurers from Ren’s prologue; or never even given names, like the seamstress or ship’s captain. That’s part of what makes the setting feel so weak here: New Phlan feels like a very empty place. Having well-developed protagonists only gets you so far if they don’t have any well-developed supporting characters to interact with. The clear theme here is self-acceptance and personal growth. Shal is horrified by her transformation from a pretty, petite young woman into a brawny, tough virago; by the end of the book, she’s learned to accept her new self and find a kind of beauty in it. Tarl spends most of the novel burdened by guilt and self-doubt, but recovers from it after he confronts his fears. Ren starts the novel consumed with grief about his dead lover, but eventually accepts her death and moves on. Everyone leaves as a better person than they were when they came in. The character development is actually handled surprisingly well, even if the plot that gets them there is often clumsy. It’s about as weak as you’d expect from a couple of first-time novel-writers. The writing is more or less mechanically competent, lacking the howlingly bad passages of some of the earlier novels we’ve seen, but it sure did make me wince on a frequent basis. Often the narration will say something, and then one of the characters will parrot the narration back to the other characters just to make sure the reader didn’t miss it. I find the unnecessary redundancy baffling. In fact, the book frequently seems to assume that the reader is a bit dim — there’s also a few places where, for instance, someone will say “I hope X doesn’t happen!” and then it inevitably happens half a page later. Most of the developments in the novel are telegraphed from a mile away, and not particularly subtly. Just as the three companions entered, the tongue of a giant frog shot out, circled Ren’s leg, and tripped the big man. Wait, what? There are no frogs, giant or otherwise, established in this scene yet. A tongue shoots out, and somehow the narrator knows that it’s a giant frog’s tongue. Something along the lines of “Something wrapped around Ren’s leg, and then they saw a giant frog on the other end of it!” would have scanned a lot better than “Suddenly, frog tongues!” And why are there even giant frogs here in the first place? Why are they just sitting in this building? There’s a somewhat perfunctory-feeling explanation later, but it still feels out of place, as if the characters got an unlucky roll on a random encounter table. It was just time for a battle scene, so cue the giant frogs! That sort of thing works better in D&D games than it does in real narratives. There are all kinds of little details which don’t make sense. How did an innkeeper manage to walk into a guest’s room in the morning when she’d explicitly bolted the door the night before? How does a wraith slip and fall from an ice storm spell? It hasn’t even got legs, for crying out loud! The book feels like it needed one more good editing pass to catch these sorts of things, but I wouldn’t be surprised if the whole “video game tie-in novel” thing put them under an impractical deadline. This shares Shadowdale‘s irritating tendency to describe everyone in the mechanical game terms of AD&D 1st Edition: “fighter”, “thief”, “magic-user”, “cleric”, et cetera. “Chaotic” is used as a technical term in a very unnatural way, and for the love of god, “rangering” is not a verb! It’s something I didn’t used to notice back when I was a teenager who played D&D so often that the game-specific terms seemed natural, but as an adult with a broader palate for writing I find it breaks my immersion terribly. I suppose it’s not a surprise coming from one of the old-school D&D authors, though. At least the pacing is solid; it’s good about interspersing quiet character moments between its action scenes, and I didn’t get that exhausted feeling while reading it that many of the previous novels gave me. It’s a hot mess, to be honest. The character work on the heroes is surprisingly good, but that doesn’t outweigh the sketchy setting, the nonexistent supporting cast, and the constant winces and grimaces I endured from the clumsy plotting and writing. There are two more novels in this trilogy, and the next one is also a video game tie-in novel, so my hopes aren’t too high for the future. It was also one of the earliest video game tie-in novels ever, as far as I can determine. There was a series of Zork choose-your-own-adventure books from around 1983, and some Japanese light novels and manga based on the Wizardry series, but as far as full-length Western novels go, the only earlier ones I’ve turned up are a pair of novelizations of Infocom’s Planetfall and Stationfall from 1988 and 1989, respectively. Ruins of Adventure probably holds some sort of record for the largest number of swords +1 ever handed out in a single module — over 200, if I remember correctly. Magic has rarely felt less special.